This red and white chess set called as color chess. They looks different from the usual chess pieces we encounter. 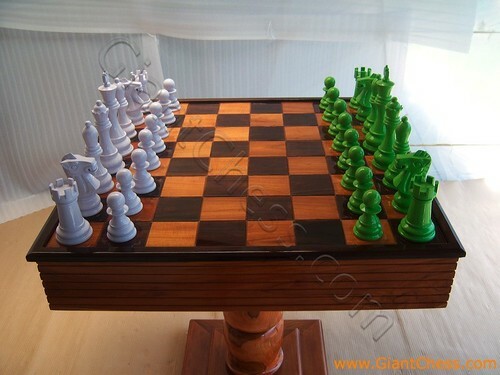 Green and white chess pieces set have stand on brown chess table. You just need stools or chair to play the chess game. Feel different atmosphere in play chess game using these color chess set. Feel its fresh and attractive gamewith your friends, partner and family. The colors promote modern and elegant look. Combined by the brown chess table, it is perfect to be placed in your house. The green will bring its fresh influence and the white bring its everlasting touch. Have it now to make your house feels different and fresh. Both of chess pieces and table are carved by our professional craftsman and made from best quality of Teak wood. The products are made of durable natural material and clear acrylic lacquer, so the products are kind of durable wooden product that can use at outdoor area. Interesting isn't it? Have it now!